And this is how it looks when I'm wearing it, and want to see the time. A simple flick of the wrist let's me know first the hour, then the minutes. It may sound like it would be hard to tell time seeing only two digits at once, but after a few tries it becomes automatic. and this is the bottom. 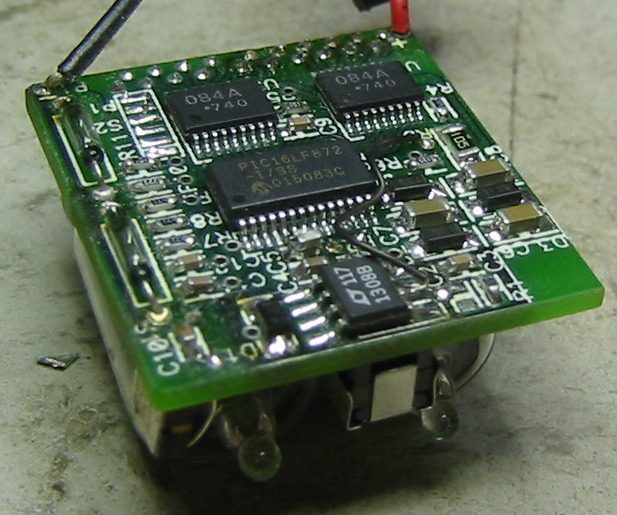 Most parts are surface mount, and it uses a PIC microcontroller. High voltage is developed by the power converter chip in the foreground, along with the square metal cased transformer shown in the picture above. 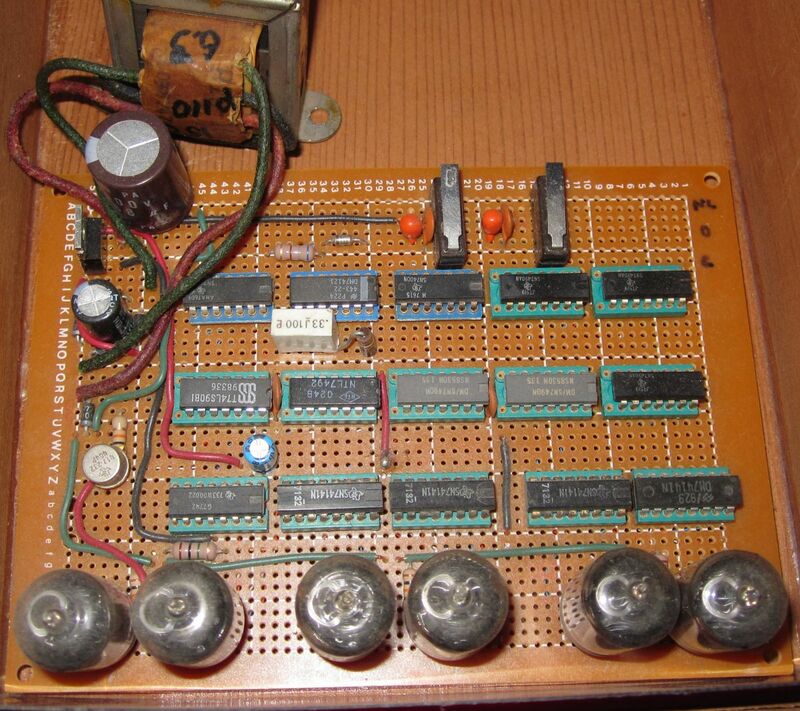 The two glass cylinders on the left of this side of the board are the reed switches which are used to set the watch with a magnet. This watch is one of the first three prototypes built in the summer of 2002. It uses a CR-2 camera battery, which I have to change on average twice a year. Here the guy who invented it is doing a quick repair. 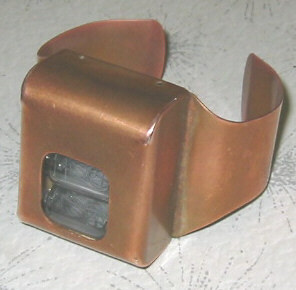 The prototype watches did not have an adjustable time base, and my watch gained about a minute every other month. 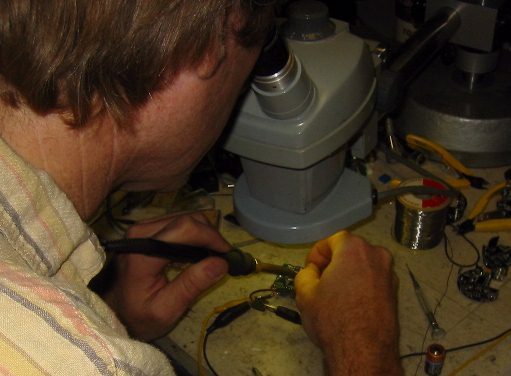 I finally had David fix it in December 2005, he just soldered on a couple more very small capacitors to get it to run at exactly 32,768 Hz. 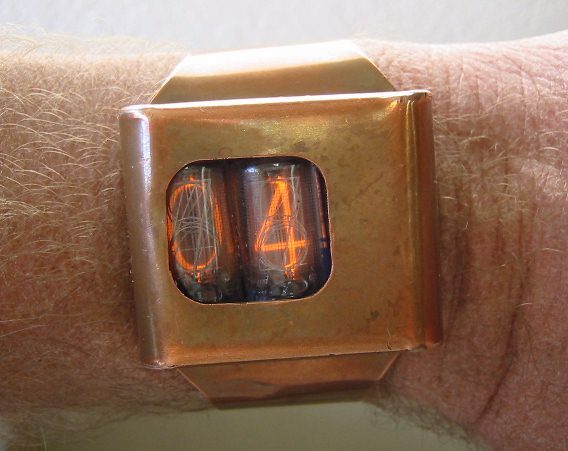 Visit cathodecorner.com and you'll see that David is now selling Nixie watchs, and they look much nicer than the case I cobbled together for mine. This old cigar box houses my TTL Nixie clock, which uses ZM1010 tubes. It has a red filter (from an old LED alarm clock) to reduce glare. It's a hack job, but it works well enough for me. Here is the working part of the clock. The breadboard is from Radio Shack, the sockets are used wirewrap type, holding the counter chips, 74141 Nixie driver chips, and various other TTL gates and stuff. The schematic I started with is from Texas Instruments, from a TTL applications book from the early 70s. I built the clock in 2002, using mostly old used parts. 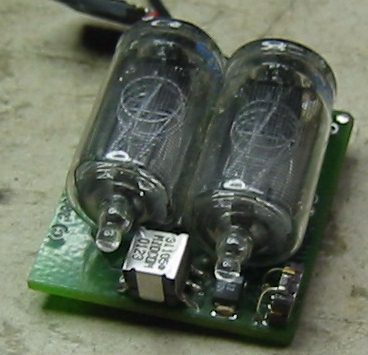 Be sure to see my "media center computer", with it's Cathode Corner NC620B Nixie Clock installed in a drive bay.